Tactsys is a designer and manufacturer of military power supplies, using the latest technology to achieve reliable specifications. This power supply can work on both AC (primary) as well DC input. This product is available in both conduction cooled as well as air cooled version. 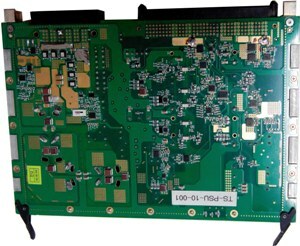 Designed for military applications, Tactsys 300watt DC input power supply is a versatile and reliable 6U VME product. Input power can vary from 16 to 36 Vdc. The three outputs(12V, 5V and 3.3V) are provided by three DC-to-DC converters, with a total power rating of up to 300W. Four indicator LEDs are provided for convenient visual indication of power supply status, indicating proper output voltages and power supply status.This product is available in both conduction cooled as well as air cooled version.